You’re Invited to the BALEENkitchen Summer Preview Party. 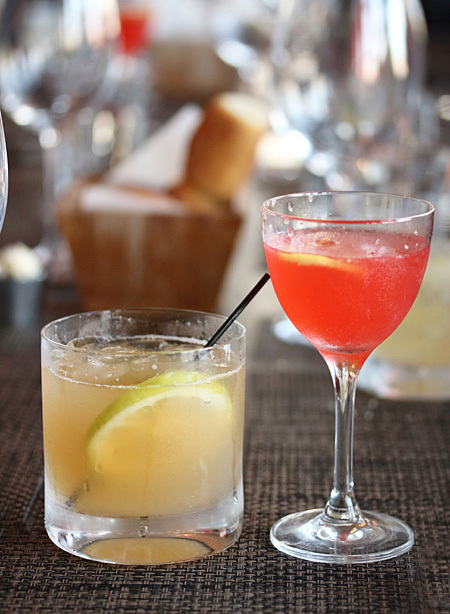 Please join us for dinner, drinks and live entertainment. This is what my invitation said and I absolutely could not say no, because BALEENkitchen is my favorite restaurant in the Southbay area, located at The Portofino Hotel in Redondo Beach. If you follow my blog, you will have read my two previous posts about BALEEN, the Dinner Menu in September 2010 and the Breakfast & Lunch dishes in June 2011, and how I went crazy for this food! Check out the photos and your mouth will start watering! BALEENkitchen has a new leader at the helm, Executive Chef Richard Crespin, who was born in San Sebastian, Spain and moved to the U.S. when he was five. His family opened a tapas restaurant and he soon moved back to San Sebastian to intern at Arzak (a 3 star Michelin) and Casa Nicolasa. After studying at the French Culinary Institute in New York, he worked in many top kitchens around the globe including Jean Georges in Manhattan, Chez Akumi in Kyoto Japan, Ozumo in San Francisco and at Gordon Ramsay at The London Hotel. He was Chef de Cuisine of Baleen LA before his promotion to Executive Chef in the summer of 2012. 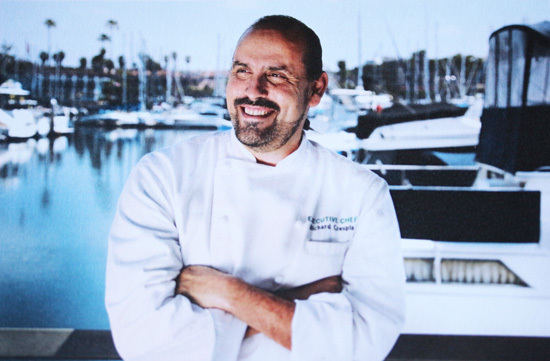 He brings an intimate knowledge of Spanish cuisine, varied experience in small bites ranging from Asian fusion to raw cuisine, and a background of formal French training. 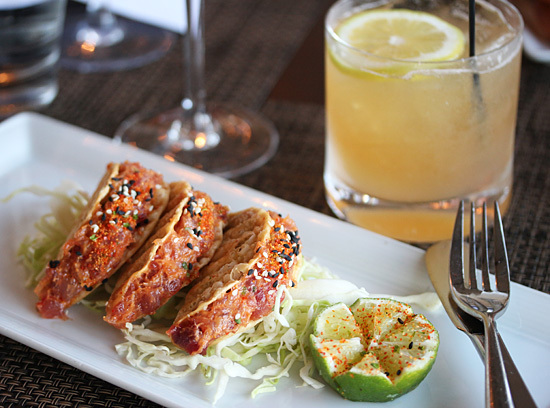 The opening photo above is one of the tapas style plates to share, Tuna Tacos, with ahi tuna, chile aioli and guacamole in a baked wonton shell. Isn’t that a beautiful presentation. The cocktail is called a Big Bourbon Apple made with Maker’s Mark, ginger beer, unfiltered apple juice, cinnamon simple syrup and lemon juice. Very tasty! 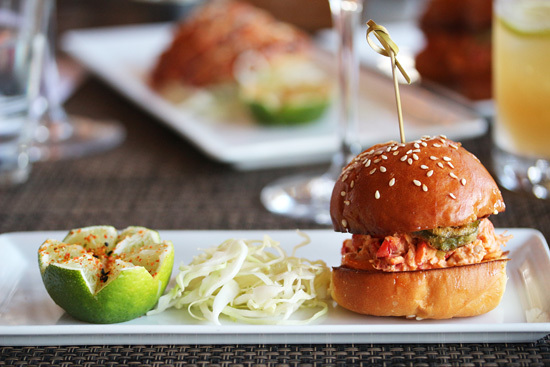 The second tapas style plate held a toasted brioche-enclosed Lobster Slider, with a spicy sriracha chile aioli and topped with a fried jalapeno. Isn’t it cute! 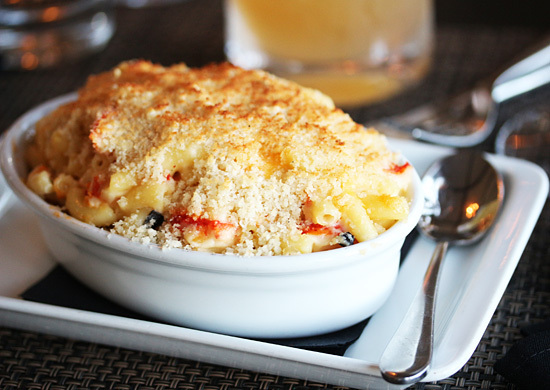 My favorite dish of the evening was the Lobster Mac & Cheese. OMG. Infused with truffle peelings and a béchamel with fontina, sharp cheddar and parmesan, all topped with buttered bread crumbs. Shall I try to get the recipe for this one? 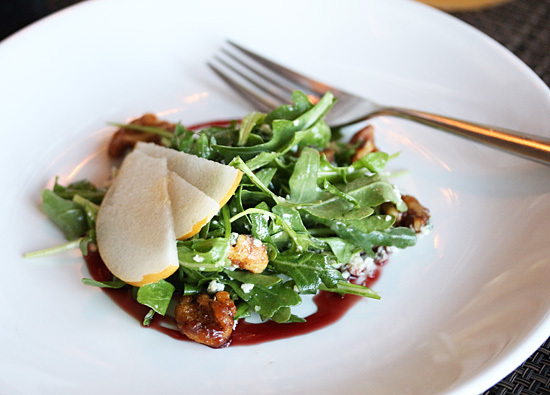 The salad course was beautifully represented with mix of wild baby arugula, candied walnuts, Danish blue cheese, Asian pear and shallot vinaigrette. In addition to several wonderful wines, we enjoyed these two cocktails, the Big Bourbon Apple, which is described above, and the rosy Noble Sunset made with Ketel One Orange Flavored Vodka, Aperol (an Italian aperitif with bitter orange, gentian, rhubarb and cinchoma liqeur), Laurent-Perrier champagne, agave syrup, and lemon juice. Can you tell that I really liked this cocktail? Such interesting ingredients. 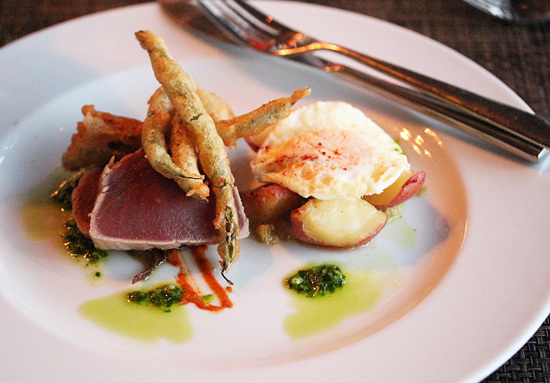 The Ahi Nicoise appears in the Entrée section of the menu. I love it when there are several components on the plate so that each bite can be a customized adventure. Here we have two sauces, Romesco and tapenade, plus tempura haricot verts, roasted potatoes, fried egg, caramelized onions and ahi tuna. And so photogenic. Isn’t this a stunning plate to look at? 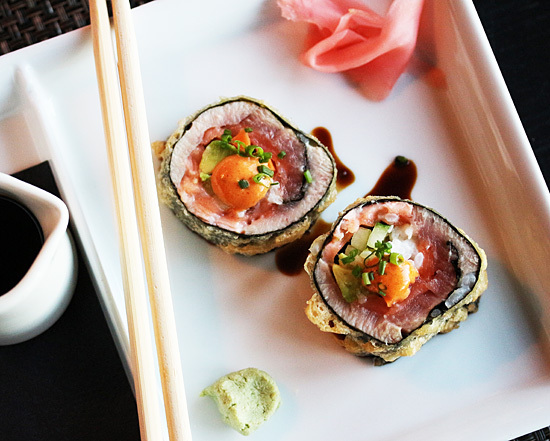 This is the tempura-fried Baleen Sushi Roll, made up of asparagus, avocado, raw salmon, ahi tuna, caviar, microgreens and the Japanese root, yamagobo. I had fun photographing this one. 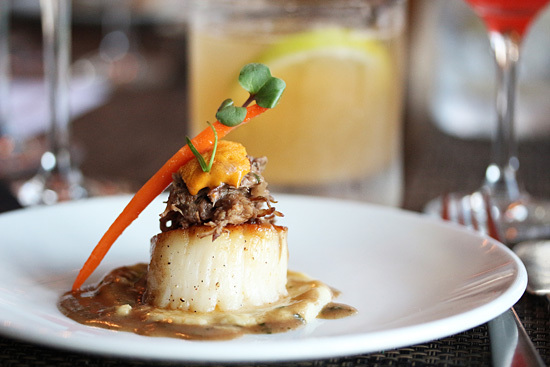 This Surf & Turf dish of roasted scallop and braised short rib with vanilla parsnip puree I originally had with the Dinner Menu in 2010. What you see here is a small teaser version, especially made for us bloggers. But you get the idea. Because the light disappeared, I was not able to shoot the last two dishes, the Fillet of Beef with Roquefort crust, grilled asparagus and whipped potato with pan jus; and the dessert of Warm Chocolate Cake with vanilla gelato. You will have to go to BALEENkitchen and order them for yourself to see what they look like. Oh, and they still serve that magnificent BALEEN Burger! Wow, it really is beautiful food!